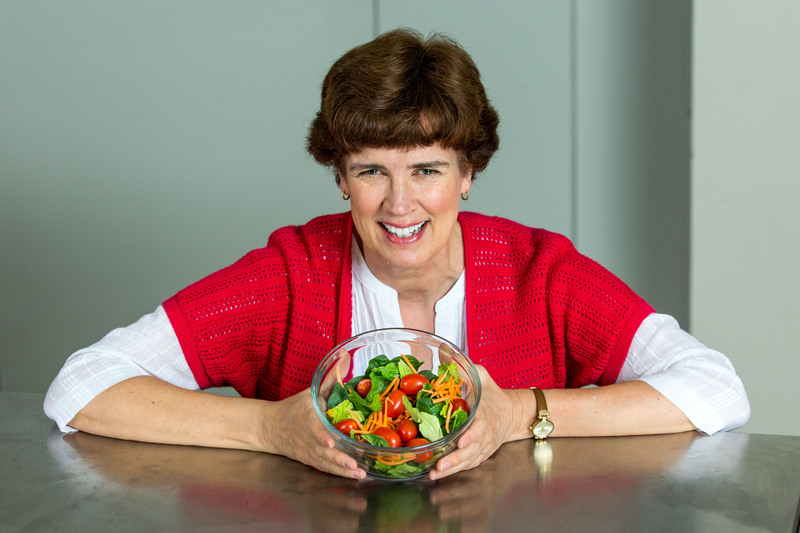 A spoonful of oil: A recently published study led by Wendy White, pictured here, tracked how the human body better absorbs eight micronutrients when salad vegetables are eaten with oil. Photo by Ryan Riley. Larger image. AMES, Iowa – The song says a spoonful of sugar helps the medicine go down, but an Iowa State University scientist has published new research suggesting a spoonful of oil makes vegetables more nutritious. White’s study found added oil aided in the absorption of seven different micronutrients in salad vegetables. Those nutrients include four carotenoids – alpha and beta carotene, lutein and lycopene – two forms of vitamin E and vitamin K. The oil also promoted the absorption of vitamin A, the eighth micronutrient tracked in the study, which formed in the intestine from the alpha and beta carotene. The new study builds on previous research from White’s group that focused on alpha and beta carotene and lycopene. “The best way to explain it would be to say that adding twice the amount of salad dressing leads to twice the nutrient absorption,” White said. That doesn’t give salad eaters license to drench their greens in dressing, she cautioned. But she said consumers should be perfectly comfortable with the U.S. dietary recommendation of about two tablespoons of oil per day. So a spoonful or two of salad dressing may indeed help you derive the optimal nutritional benefit from your veggies. The relationship between a spoonful of sugar and the medicine going down, however, remains outside the scope of White’s research. Some dressing with your greens may help you absorb more nutrients, according to a study from an Iowa State University scientist. The research found enhanced absorption of multiple fat-soluble vitamins in addition to beta-carotene and three other carotenoids. The study appeared recently in the peer-reviewed American Journal of Clinical Nutrition, and the results may ease the guilt of countless dieters who fret about adding dressing to their salads.